On 11th January we attended The Integrated Care Clinics (TICCS) event ‘More Good Days’ in Surrey Heath. The event was free for all to attend and aimed at anyone living in Surrey Heath, looking to make positive lifestyle improvements. 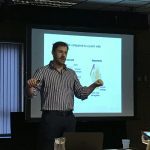 Comprising of targeted information zones, the event covered a lot of topics relevant to helping people with long-term conditions improve their quality of life, such as smoking cessation, healthy eating, and looking after your mental wellbeing. 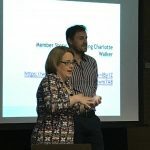 During the morning, Arthritis Action’s Therapies Manager presented a talk on osteoarthritis management techniques followed by our Member Charlotte Walker introducing a video of her story and completing a Q&A session with David. 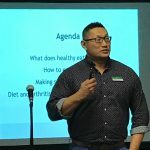 In the afternoon session, our Dietitian and Services Development Manager Martin Lau presented a talk on eating well for arthritis.